When at Velocity, you do things the Velocity way and that’s exactly where the celebrations walk in. 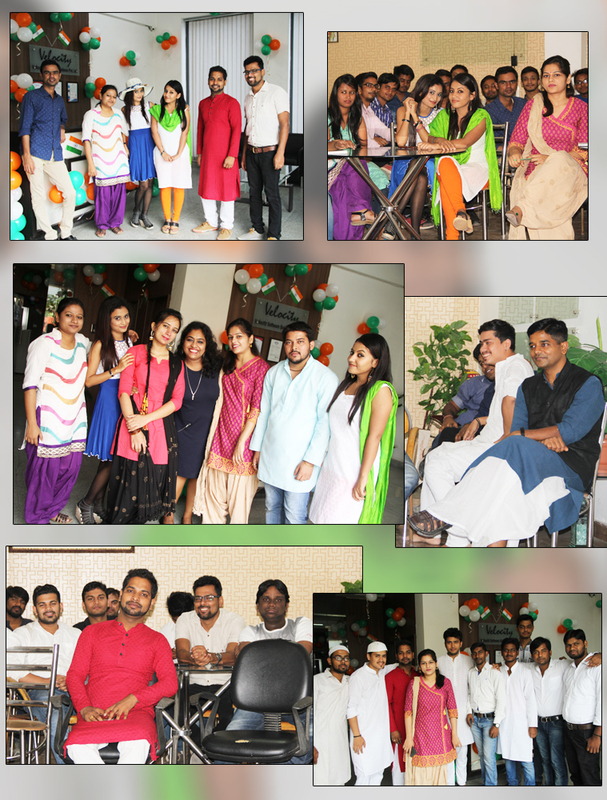 Every festival in the company is celebrated with utmost zest and enthusiasm by one and all, and this time the company celebrated the Independence Day. Just to find those pocket-sized ways to happiness and relieve all the stress, everyone at work received a mail from the Human Resource Department. The email mentioned that this year, Velocity would celebrate the Independence Day in style. How?? Well, every Velocitian was supposed to dress according to the state where they belonged. If that was not possible, they had the liberty to choose their favorite state and dress accordingly. Sent a week prior to the celebration, everyone got to search what will they be wearing and their checklist was ready. Now, on the D-day, when the doors opened up, all you could see was Punjabis, Maharashtrians, Goans, Delhiites, and the (the people from) different states started to walk into the office. It was indeed a pleasure to see the diversity under one roof. All the beautiful faces with dresses going from ethnic to westernized, patriotism came in all sizes that day to Velocity to celebrate the Independence Day. While the day started with happy faces getting themselves posing for the shutterbugs, our boss came around complementing each and everyone for the hard work they put in to look how they were looking. With all the smiles and cheer spread in the office, the celebrations began with the play rehearsals. Yes!! Teams were divided into small bunches and were asked to prepare a play with the theme “India”. Every nook and corner of the facility was occupied by the teams rehearsing their dialogues enacting their scenes. Now was the time when everyone gathered in the cafeteria and the celebration by a welcome note by our HR Ambuja Trivedi followed by the plays. The lunch break called all the Velocitians to have proper Indian food together. What was served in the plates has Poori Sabzi, Papad, pickle, daal, gulab jamun for dessert and for sure the chocolates (as a custom of Velocity to make sweet memories). Everyone sat together eating and sharing laughs over the dresses and the makeup everyone was sporting when the time came for the plays to be presented in the open. A total of four (4) plays were enacted in front of the audience (management and other employees) with the central theme of India and patriotism. Every group came up with something unique which left the audience astounded with the loud cheer of claps and hooting when the teams bowed in front of them at the end of the enactment. With a variety of genres including comic, satirical, patriotic and more, every team was stupendously marvelous in their own respect. Once the plays got over, the audience (and the participants) were handed slips to rate their favorite composition and the decisions came out later. The winning team got a big box of chocolate and some consolation prizes were handed over to the best actor as well. That’s not it! The other teams were also provided goodies. The day came to an end by singing the National Anthem while everyone remembered the sacrifices given to get an Independent India that we live in now. The photo session continued while everyone enjoyed posing with their teams.